We were the Stock Berhaut Brun family, all eight of us!!! We were a his, hers and theirs family, what they call blended. 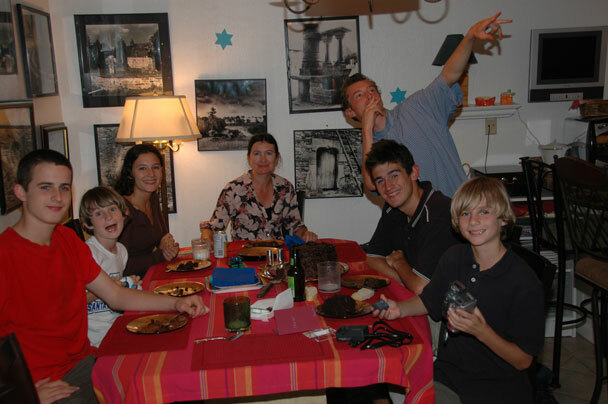 Charles (with his arm around his maman’s shoulder) and Alex, in the back row and 10 and 8 at the time of the above photo, are our joint efforts. Alban (16 in the picture) and Daphné (18), both on our left in the photo, are hers, and Nick (19) and Tom (16), on either side of their dad, are his. The collective made up our big, noisy whirlwind of energy. At times we were more agitated or churned up than blended, and at other times we were blended smooth as silk. It’s all in the pictures! Our tapestry is made of the almost 16 years of our lives which we shared together, from 1994 through 2010. Our family, or families, continue to weave their own tapestries as we move on, but they are not in this volume of my memoirs. This volume is a portrait and a history of the lifetime of our blended family, how we came together, what our lives were like all together, and how we moved apart. It is a portrait and a history, all in one. It was rare to find all eight of us together in the same place. 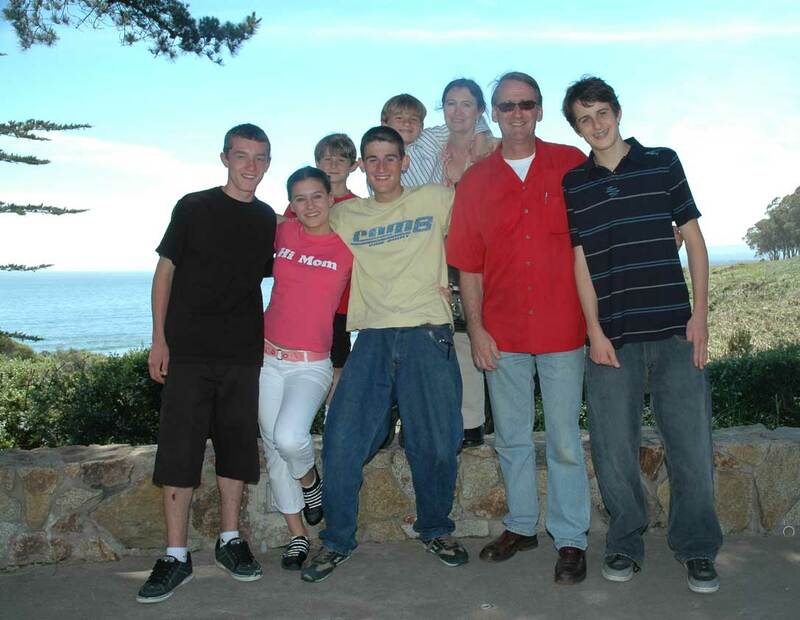 On Mother’s Day in May 2006, all of the children accepted the parents’ invitation to defer their pressing social obligations and brunch with us at Seascape Resort in Aptos, one of Santa Cruz County’s local hidden treasures. A tourist who had been admiring the view took this one, and we greatly appreciate her results. We had all eaten well and were on a relaxing after-brunch stroll down to the beach. At the table in the breakfast nook for Charlie’s birthday in 2007. I took this one: The reverse version, taken by maman, is on the papa page. Photographs are memories, and that is a great one. An after-brunch stroll captured by a complete stranger, and a piece of each of us is accessible. That’s what makes a good portrait. Photographs inundate this site, mostly of us in our little groups, and all of them have some little memory, some little tale. We have such wonderful memories! But let’s start with this photo album’s genesis. As you can see here, first there were albums on card, organized by themes. That organization was transposed to the web during the course of our family’s life, in around 2000. Then the web themes were expanded over the years. From a photo album on the web with little text other than brief captions, this volume of memoirs has expanded since the parents’ separation into a photo journal, an increasingly complete record of our collective lives together. October 1999. 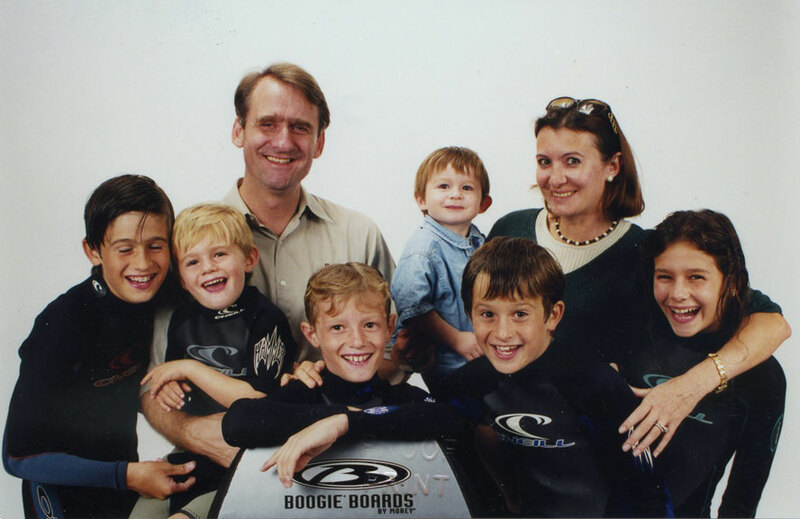 This photo was taken during one of only four sittings of the eight of us together in the entire 12 years that we all shared (after Alex was born, that is). We had taken the children boogie-boarding in Capitola, and stopped at the photographer’s on the way home. We have themes. Our first basic theme is people, and this being a family, our themes start with children and parents. Marie-Hélène and I (Ian) are the parents, and the “big kids,” Nick, Daphné, Alban and Tom, and “little guys,” Charlie and Alex, are the children. Just to show that we are not entirely self-obsessed, we also have friends and family pages. These include grandparents, the Hanlons (friends of both), and Alex and Charlie’s friends. There are more. Our second basic theme is the passage of time for us and ours, our history. This is a substantial theme, the core of the updates of these journals following the parents’ separation. This is the part that we hope the children will each read at some point. 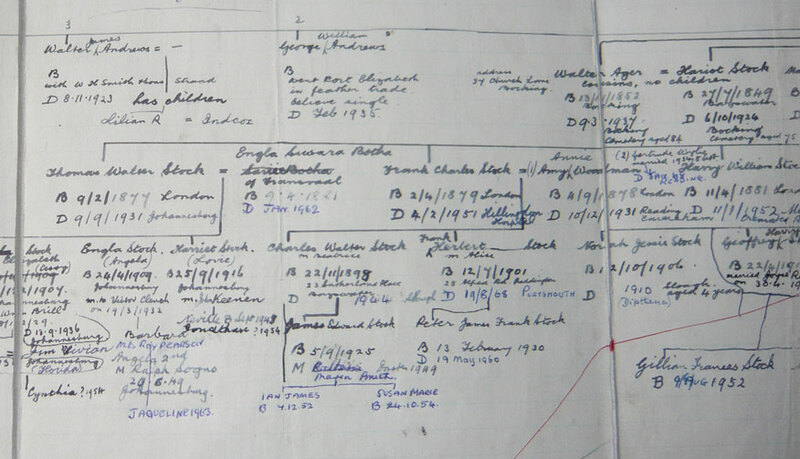 I am not the first Stock to immerse himself in family history. 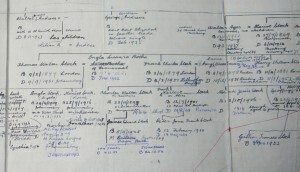 Uncle Alfred, one of my great-grandfather’s younger brothers, painstakingly put together a family tree ending around 1960. This is small piece, ending on our branch with Sue’s and my arrival. We’re a little bit modern in the sense that some of our history preceded the wedding! 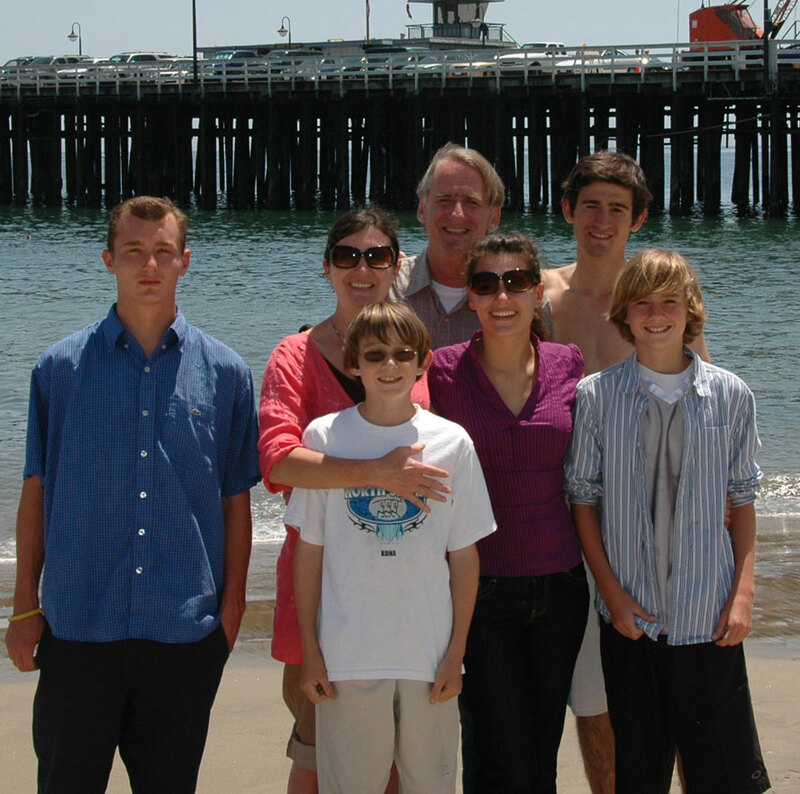 It includes the phases in the life of this family, starting with the blending of the two then existing families when we moved in together in 1994, and continuing with Charles’ arrival in Brittany in August 1995, our wedding in May 1997 and Alex’s arrival in Santa Cruz in January 1998. Our third blended family was then complete. The history is also captured in our various homes, which have been in France, England and California. The blended family continued through the years, two rounds of graduations, Nick’s, Daphné’s and Alban’s moving out, and Tom’s moving back to Paris. Before we knew it, the older children had pretty much spread their wings and left, as they are wont to do. But they are still all attached, to each other and to Marie-Hélène and me. Our tapestry is woven with stronger thread than they might know. 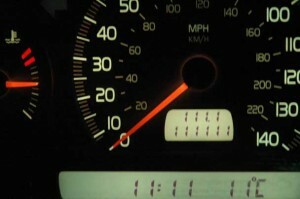 Dashboard perfection!! Caught in January 2006 by Marie-Hélène in what was then her Volvo. We were out for dinner, knowing that the 111,111 milestone was coming up, and she had already synchronized the trip odometer to give us 111.1 simultaneously. We were ready for a great collection of ones. But it got better when, after dinner, she though to see what the temperature was in Celsius: in Fahrenheit, there were no ones in view. At the restaurant it was 9C. At home a little later it was 6C. But in downtown Santa Cruz, where she parked to marvel at this extraordinary sight and preserve it for posterity, it was 11C. Okay, so we did wind the clock on so that we did not have to sit in the center of town for an hour and a half, when the temperature might have changed in any event. But how many times have you seen anything close to those numbers! Perfect! We also approach our history with a carousel of time, a kind of diary, composed in retrospect for each year from 1994 through 2009. The text for each of those years was normally prepared as an annual update for friends and family. In 2008 and 2009, this volume of memoirs became a blogged photo journal organized by year. If you want the basic outline of our lives all together, those annual updates will do the job. But they are not short! The final basic theme is our various activities. In a sense, they are all part of our history, of course, and expressions of each of us. We go on vacation, enjoy a collection of hobbies, and have a ton of fun on special days, what the French call fêtes. Our vacations most often include France, England and California! They also include Disneylands in France and California. In North America, we have travelled to Florida, Vancouver BC, Colorado and Death Valley. Our hobbies include some that you might expect, such as video games and surfing, and others less hobby-like, such as homework and trains. Fêtes are mostly pretty much obvious, as in Christmas, Thanksgiving, Halloween and more Christmas. It may only come once a year, but the years did add up! 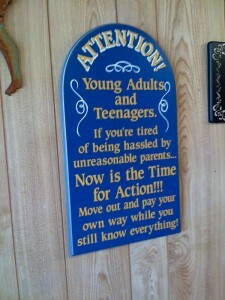 Having raised teenagers for eleven of the sixteen years we were together, we parents heartily endorse the above advice! There is the Santa Cruz Beach Boardwalk, our town’s very own funfair or carnival, and West Cliff, home of the surfing museum and a great Sunday afternoon stroll or weekday bicycle ride. Here are Faby and Jean, with Fiona, Maeve, Leah and Chenoah. Here are early photos of Nick, Daphné, Alban, Tom, Charles, Alex, and Alex and Charles. Here is Charles and Alexander’s belated baptism in Brittany, in August 2004, Courtney Bolin and Antony Nash’s wedding in La Jolla, California in November 2003, the 25th reunion of my law school class in October 2007, and Laura Nash and Damian McClarin’s wedding in Coronado, California in February 2009. Here is Edgar, our loved (and seriously misunderstood!) motorhome, a walled city for privateers in France, a little fooling around, and even a little stamping. It never stops! Oh yes, before I forget, a little soccer, and a little more, and a little more. One of the last photos of most of us together, almost a year before Marie-Hélène and I moved apart. It was mother’s day in 2009, and we took a stroll along the beach in front of the pier (called the wharf here). Tom had already moved to Paris. When you come to the end of a love affair that lasted close to 20 years, as Marie-Helene and I have done, little remains but recriminations and heartache. There are moments when it can be difficult to see what it was all for. The children too live through a dark period, reflected in the prism of their parents’ dark eyes. 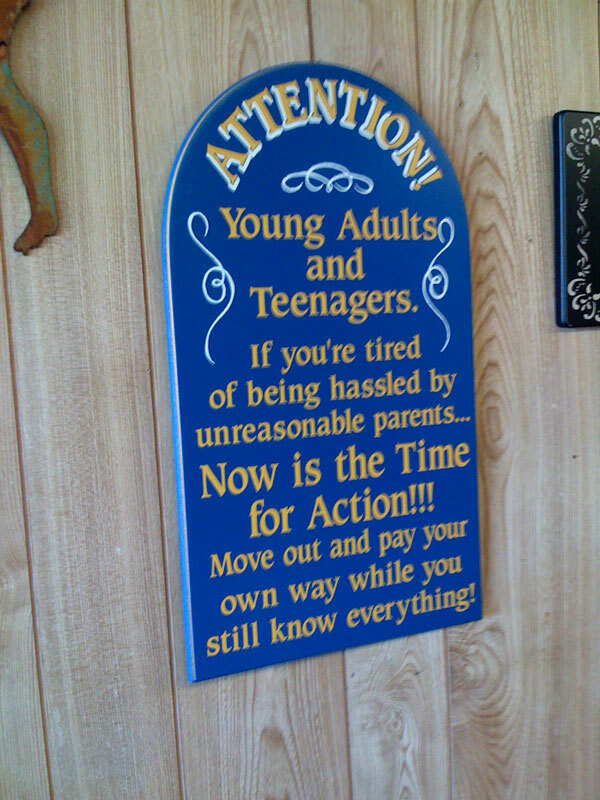 Only the bad is visible to the parents for a while, the inevitable disappointment and resentment that make up much of their divorcing lives. The children too can forget what it was all about. When those moments arrive for me, I delve back into these memoirs, and remember again. What it was all about is all over this volume. I added to it and elaborated it and reworked it for months and months, finally for years, after we separated. Doing so felt like creating light out of the darkness of the divorce. On some levels, not a whole lot changed after I moved out. Here’s Christmas 2010 in the condo, with Tom strumming on his guitar, Nick coding, and Alban and Alex playing a video game. Life goes on! Weaving our tapestry again here, completing it with stories and photographs, brought the good times back into focus, made the whole picture reappear. There was so much going on in the family before things went wrong between the parents, so much excitement, so many fun times. Hopefully, our children too can use this site to look back themselves on that whole picture every now and again. It’s worth it: trust me on this one! The 16 years we all spent together were rich and full and beautiful, six children on two continents, all so different, all so alive. Nothing stayed the same during those 16 years: we all grew and aged and changed and evolved, and even the years themselves couldn’t last forever. Nothing lasts forever. But don’t forget, children, that with a bit of effort and a lot of love you can make everything worthwhile, even the little things. As we did. For such a long time.